Specifically designed to access shelving units without damage. Flat 'step like' treads for comfort in use. Timber cross rail as standard. Shafting hooks available to special order. 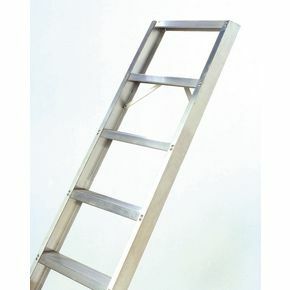 It is recommended that shoulders should not be above the top of the ladder when in use. Accessing shelves that are high up can be difficult and not all ladders or steps are suitable for the task as they may not allow safe access or they might damage your shelves. Our shelf ladders are a great way to help users reach items stored on shelves, as they are specifically designed to access shelving units without causing damage. Flat 'step like' treads offer underfoot comfort for the users and they have a timber cross rail as standard. They are lightweight but extremely rigid, making them easy to carry and safe for the user. Shafting hooks are available to special order and it is recommended that the user's shoulders shouldn't be above to top of the ladder when in use, for safety. They are available in nine sizes; 5, 6, 7, 8, 9, 10, 11, 12 or 13 rungs. Our shelf ladders are an excellent addition for access to shelving that is high up, keeping the user safe and supported; they come with FREE UK Delivery.